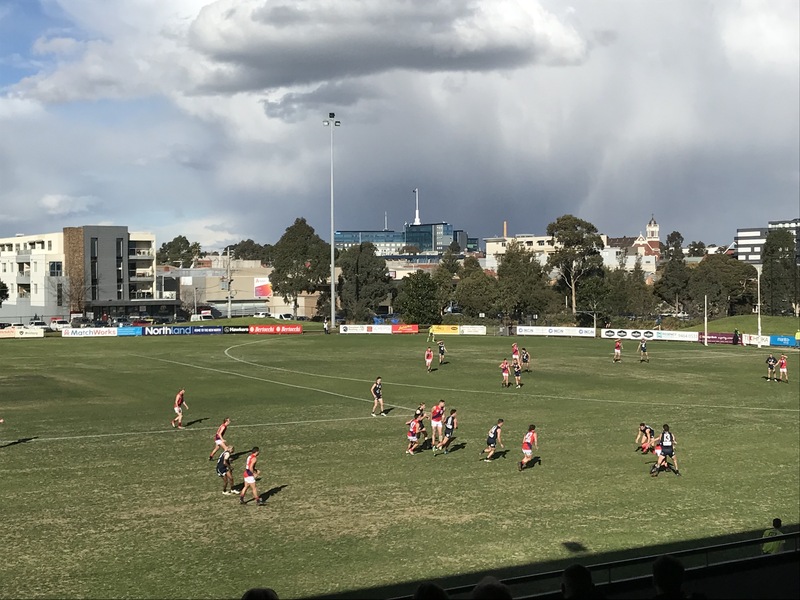 Coburg has been defeated by 16 points by the Northern Blues this afternoon, despite playing some good football for long patches of the game. It was a four-minute period in the third term that proved to be the difference, as the Blues put their foot down and kicked four consecutive goals. The Lions started the game off well, controlling the play and moving the ball efficiently for much of the opening quarter. Coburg’s forwards struggled to shake their defenders inside 50 and it was Sam Lowson (4 goals) who looked most dangerous in attack. He kicked the Lions’ first goal after the Northern Blues kicked the opening two against the run of play. The Blues got a run on late in the first term and ended up having more than double Coburg’s inside 50’s, which allowed them to kick a few late goals and take an 18 point lead into quarter time. Jesse Corigliano (19 disposals, ten rebound 50’s) stepped up in the second quarter and took control of the game. Corigliano’s rebound from defence and ball use were both highlights as he showed why he has been one of the Lions most consistent players all season. The Northern Blues were again able to kick the opening two goals of the quarter as they lifted their work rate and the Lions struggled to go with them, going back into their shells. It wouldn’t be for long though as Josh Iacobaccio kicked a great goal on the run to give Coburg some much needed momentum and belief. Peter McEvoy and Lowson both slotted tough set shots to make it three in a row and cut the margin to under three goals at half time. The Blues again hit the scoreboard first in the third quarter but it was quickly answered by a Coburg goal. Nick Mellington (23 disposals, nine clearances) was on fire in the midfield, winning a crucial clearance and getting the ball forward quickly which allowed Jack Murphy to get out the back and run into an open goal. Following this, the Blues put their foot down and Coburg was slow to react. The Lions lost their shape and discipline which allowed the Blues to kick four consecutive goals which blew the margin out to seven goals. Assistant coach Andrew Sturgess spoke post-game about this costly patch of play. “We lost our cool a little bit to be honest; we got caught up in the emotion of the game and with a young team, when momentum is on your side you look really good but when it’s not, it can look really ugly and that’s what we saw today,” he said. All seemed to be lost but Coburg wrestled back the momentum and gave itself a chance. Lowson continued to cause problems for the Blues defence while Billy Kanakis (18 disposals, six inside 50’s) was rewarded for his hard work, adding his name to the scoresheet. Despite missing a couple of golden chances late, Coburg were still a chance at three quarter time, trailing by four goals. The belief continued to grow early in the last quarter as Marcus Lentini (21 disposals) kicked the crucial first goal. The game spent the next ten minutes on a knifes edge before Lentini again snapped truly, this time reducing the margin to 15 points, halfway through the last term. Coburg’s defence remained strong throughout the whole last quarter, while the midfield also started to take control. The play was all going the Lions way and when Guthrie nailed the third goal of the quarter, there was just nine points in it with ten minutes to play. Unfortunately, the comeback wasn’t to be as the Northern Blues sole goal of the last quarter was the only goal left in the match. Sturgess rated Josh Iacobaccio (17 disposals, five inside 50’s, four rebound 50’s), Lochie Dickson (18 disposals) and Lowson as some of Coburg’s best while also heaping praise on Mellington. “Nick Mellington through the midfield was fantastic, his clearance work was really positive and his transition with the ball was really good but he also looked dangerous up forward,” he said. Next week sees Coburg partake in its final match of the season against Geelong at Piranha Park, before a bye in the last round. Be there from 12pm on Saturday to see all of the exciting action live. Goals: Lowson 4, Lentini 2, Watkins, Iacobaccio, McEvoy, Murphy, Kanakis, Guthrie. Best: Goodwin, Lowson, Iacobaccio, Kanakis, Mellington, Nolan.